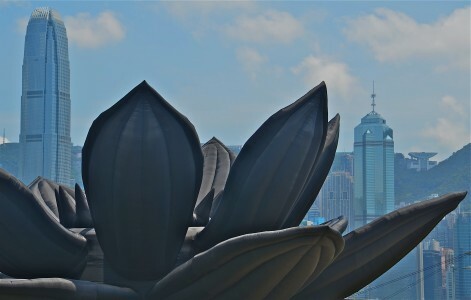 Art Basel Hong Kong was a perfect time to launch the M+ Museum’s new programme with a scuplture park of giant inflatables at the West Kowloon Cultural District. This programme will activate the urban area around the M+ museum, due to open in 2017 on a newly developed area of 40 hectares on the waterfront facing Hong Kong Island, with a master plan designed by Foster and Partners. Six large inflatable works by Cao Fei, Choi Jeong Hwa, Jeremy Deller, JIAKUN ARCHITECTS, Paul McCarthy and Tam Wai Ping and a large performance piece by Tomás Saraceno now give a glimpse into what the future might look like when large scale public art is combined with world class architecture. It will certainly become an exciting public space for Hong Kong and a beacon for international visitors. Works like Cao Fei’s House of Treasures — an oversize inflatable suckling pig highlighting themes of prosperity and abundance, and Choi’s giant, breathing lotus blossoms are perfect examples of how public art can mutate the landscape and capture the public’s imagination. Sacrilege is a life-size bouncy castle in the shape of Stonehenge by Jeremy Deller, where a prehistoric monument becomes an interactive public sculpture. Architects Tomas Saraceno and Liu Jiakun have created sculptural installations that mirror the built environment. Saraceno’s piece is an inflatable biosphere that resembles giant soap bubbles and only activated when weather allows. Jiakun’s red spheres float under black netting creating a quiet structure for the public to contemplate. Another sculpture – Complex Pile by Paul McCarthy is a 51-foot-high, 110-foot-long, inflatable sculpture of a twisted pile of excrement. This work mocks its picturesque surroundings and pokes fun at the typical tame qualities of public sculpture. Certainly this work and the others stimulated debate about public art and its role in helping to define a cityscape. M+ also took the opportunity at Art Basel Hong Kong to announce the shortlist of design teams for the museum – due for completion in 2017.